“H” is for the Harvest. to cut and store the golden grain that's then made into flour. A few years ago I went on my first ever retreat at a small monastery. The food there was very good, mostly grown by the monks themselves or given to them by the faithful who came to visit their church. Each monk cooked few days a week and they all contributed to the feeding of the entire community through their manual work. At every mealtime they would say Grace briefly and thank God for the food set before them. This left me a little surprised, because I wasn’t used to say Grace at home, but also because it made me think how I took for granted the food on my plate, only vaguely knowing the efforts and the odds involved in producing it. But when your food comes from the soil you work or from the generosity of others, giving thanks to God makes more sense. In saying Grace the monks remembered that everything they had for their life was given to them, provided to them by the goodness of God working through his creation and through the generosity of others. Following St Paul’s instruction and remembering that all that we have is given to us in one way or another requires humility and in the same way humility is also necessary if we want to set our hopes on God alone and genuinely give him thanks for what he provides. This is because the virtue of humility grants us to see our proper place in creation, a place in which we are not infallible, almighty gods ourselves, but creatures formed by the one, only God, and creatures who depends on him for everything. “H” is for the Harvest. But I would suggest to you that “H” is for humility. 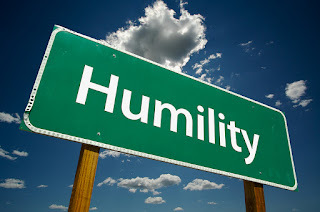 Practicing humility in our daily affairs allows us to do three things; first, to be truly thankful towards God as we acknowledge him as our creator and as the provider of all good things. Second, it allows us to be content with what we have, with our work, food and livelihood – humility doesn’t take away hopes of bettering ourselves, but it gives us the stability to be happy, settled, and content with what we receive from God. Third, humility enables us to recognise others for what they are – fellow creatures of God, not means to achieve our wishes. So in humility we recognise the value of other people’s work – of our farmers, for example; humility makes us thankful for what they do, and leads us to pursue justice for them through fair pricing and a fair market. In humility we recognise the needs of others as well; this virtue stirs up our generosity and makes us share the gifs we have readily received with others. “H” is for the Harvest and “H” is for Humility. with the good gifts you bestow on us. and pattern of humility, Our Lord Jesus Christ.